The individual Australian and New Zealand Post-Polio Networks first met as a group in 1991 at a conference in Victoria. Here representatives of the various Networks present got together to have a chat about common experiences. As a result, “Polio Australasia” was born. There were no formal structures put in place, but at least we were talking to each other and exchanging newsletters. In 1992 the Networks met again, this time in Adelaide at the “Polio Partnership” Conference. This meeting resolved to develop a constitution and look to formalising the structure so that the Networks would have a true “Australasian” voice. Unfortunately not much work was done in this regard until the New South Wales Network got the ball rolling again early in 1994. NSW circulated to all Networks for comment a sample constitution which had been provided by the South Australian Network. The NSW representatives undertook to collate the comments and prepare a draft constitution for consideration by all Networks at the New Zealand conference. The draft was completed and circulated a few weeks before the conference which was held on 23 to 25 September 1994. In New Zealand, Network representatives met on the first day of the conference. Delegates from New South Wales, Victoria, Queensland, South Australia and Western Australia, as well as from New Zealand, were present. After giving informal reports on Network activities since we’d last met, the delegates considered the constitution. After much discussion, it was decided that the Australian and New Zealand networks would be better at that time to remain as a loose grouping of co-operating societies, exchanging newsletters and information and supporting each other’s conferences. It was suggested that each group in turn be the central point for information collection and distribution to the other networks. The initial roster agreed on would see Queensland undertake this role in 1995, Victoria in 1996, and New South Wales in 1997. In the event, this informal roster system did not function. We also talked about the location of future conferences. New Zealand said they may hold another conference in 1998, while Victoria was interested in organising “Polio 2000”. New South Wales was asked to consider holding a conference in 1996, which was duly held over three days in November that year. It was called “Living with Late Effects of Polio”. Victoria in its turn held the “Polio 2000” conference in Melbourne in January 2000. At the conclusion of the conference, Network representatives met for an informal chat and again tried to set up a structure whereby we could communicate with each other more readily. The late John Foyster (South Australia) set up an email list, but it regrettably soon fell by the wayside despite the best efforts of some members to keep the impetus going. At the most recent informal meeting of Network representatives following Polio Network Victoria’s Polio Day in October 2005, Gillian Thomas (New South Wales) floated the idea of a “Think Tank” where we could all get together in a more structured setting and really debate the issues that are affecting us and our ability to keep the predominantly volunteer Networks going. She expressed the hope that a National Plan could be developed with input from all stakeholders to ensure that polio survivors receive the information, the services, and the support they need into the future. All Networks enthusiastically took up the challenge to formally meet on 3 and 4 May 2007 in Parramatta, Sydney, to debate these issues and formulate strategies to, as the Conference title stated, “design a future”. Who better to do so? Over the next twelve months, a Memorandum of Understanding was developed and agreed by each State Network, a Constitution developed and adopted, and Polio Australia Incorporated became a reality. The task of properly resourcing the new organisation became the most important initial priority. Trips to Canberra to educate politicians and public servants about the long-neglected needs of polio survivors now became the exhausting but necessary norm. Over the last few years we have constantly improved and refined our funding proposals. In doing so, we are recognising that ageing volunteer polio survivors with increasing disability will not be able to keep going indefinitely, providing services on a shoestring which should rightfully be properly resourced. We are therefore actively seeking to establish partnerships with and obtain funding from government, corporate and philanthropic sources. In 2009 we were fortunate to secure a small amount of philanthropic funding which enabled us to open our national office in Melbourne in January 2010 and employ a part-time National Program Manager for two days a week for one year. This was increased to full-time in January 2011, following a three year grant from The Balnaves Foundation. Since then, the (admittedly so far limited) programs we have been able to put in place are starting to reap rewards and we are hopeful that we will be able to obtain sufficient funding to continue the employment of staff to enable our full suite of nationally-consistent information and education programs to be rolled out across Australia. Please browse this site for more details about our achievements to date and the actions we are taking to consolidate and expand our activities to provide long-overdue services to Australia’s polio survivors. 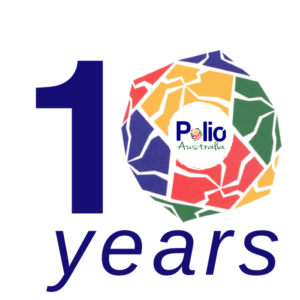 In August 2018, Polio Australia celebrates its 10 year anniversary. To celebrate this achievement, we asked “How has Polio Australia helped you in your experience with post-polio?” – you can read some responses on the right! Take a look at our 10 year timeline featuring highlights of our achievements over a memorable ten year period!